Michael Franti began his musical career in 1986 with a vision to bring social justice and laughter to society through his music. Equipped with only a bass guitar purchased from a pawn shop and a knack for poetry that flourished under the tutelage of a priest, he set out on his mission to make the world a better place. Almost 25 years later, his first hit song “Say Hey (I Love You),” reached the Top 20 on the Billboard 200. “I had a nice, long time to get ready for that first hit,” said Franti. Born in Oakland, California, on April 21, 1966, Franti has made San Francisco his home. He has become a legend of sorts, known for his work in social justice, his socially cognizant lyrics, and his contributions to peace as a musician, poet, filmmaker, philanthropist and activist. City residents may catch a glimpse of his image on a billboard, or if they are fortunate, spot him walking along the sidewalk barefoot in the Mission, on his way to visit his favorite taqueria. In 2000, he decided to go barefoot for a few days – and liked it so much, he never went back. His soles have been hitting the pavement ever since. Standing 6 feet, 6 inches tall, with long dark dreadlocks and olive-brown skin, he is hard to miss. Like the city, Franti is diverse. His father is African American and American Indian, and his mother is Irish, German and French. His mother put him up for adoption, fearing her family’s rejection. He was adopted and raised by a Finnish American couple, Carol Wisti and Charles Franti. In 1991, he formed a spinoff band, The Disposable Heroes of Hiphoprisy, which blended hiphop, punk, rock and jazz, and included Charlie Hunter. In 1994, Franti formed Spearhead. It captured the raw energy of his previous work, but also twisted it up inside folk, funk, and reggae – resulting in a unique sound that seamlessly blended all the genres together. Michael Franti and Spearhead have put out 19 albums since then, including their latest full-length recording “The Sound of Sunshine.” Over the years, the music has become more refined, and Franti’s positive vibration and message of peace have proliferated into a resolute foundation. “With time, you get a better sense who you are, and how to put all your musical passions into your own style,” said Franti. Possibly his most uplifting album yet, “The Sound of Sunshine” was the product of his near-death experience. While on tour promoting Spearhead’s album "All Rebel Rockers" – released in 2008 – his appendix burst. There was some confusion in the diagnosis, and Franti nearly died at the hospital. For eight days as he lay in recovery, he contemplated life and his priorities, and he came to the conclusion that it is really about the people he loves. Inspired by the experience, Franti wrote the songs for the album and strived to pass along a sense of hope and possibility from which others could garner strength. Franti immerses himself in social activism, philanthropy and the promotion of peace. He has put on the Power to the Peaceful Festival for the last 12 years. The free concert, held annually in San Francisco, includes uplifting music, yoga, action sports and environmental and social justice workshops. It supports nonprofits such as Soles4Souls, which has given away 5.5 million pairs of shoes to the needy, as well as Conscious Alliance, which holds a food drive to stock the San Francisco Food Bank. CARE, a leading humanitarian organization against global poverty, is a major sponsor of the festival. Franti is the San Francisco CARE ambassador. CARE places special focus on working alongside poor women, because the organization believes that with the proper resources, women have the power to help whole families and entire communities escape poverty. 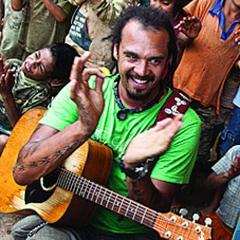 In December of 2009, Franti traveled to East Timor and visited several CARE projects. In that country, 70 percent of the population earn less than $1 a day, and thousands of children die each year from malnutrition. CARE works with villages to create sustainable farming for food. Franti spent time in remote villages and led sing-a-longs with the children of those villages on his guitar. Art and music are used as building blocks in psychological and social reconstruction by CARE – the island is devastated from violence, and there is a special emphasis on the young ones. Visiting with local artists and musicians, Franti learned that the population of East Timor before the occupation by Indonesia was 800,000 – today they say there are only 200,000 people left. A Hunters Point resident, Franti supports The Hunters Point Family, a nonprofit organization that helps youth at risk within the community. He created a clothing line of “yoga wear” called Stay Human, and 10 percent of all proceeds go to the Bumi Sehat Natural Birthing Clinic in Indonesia. San Francisco has recognized Franti for his efforts of good will. The San Francisco Foundation Community Leadership award was bestowed on him in 2009, and The Rex Foundation’s Ralph J. Gleason Award in 2010. Michael Franti and Spearhead are currently touring the globe on “The Sound of Sunshine” tour. Their live shows are famous. Fans say it’s one of the best shows you will ever see – full of energy, fun and interaction. “That man is really making a difference,” said Elizabeth Kennedy of San Francisco, during a recent performance at The Greek Theater in Berkeley. It was her first time seeing Franti and Spearhead. She was amazed at Franti’s message of peace, which he presented through broadcast media and music during the show. At one point during the show, virtually all those in the crowded arena were on their feet dancing and smiling in harmony with Franti. Children, parents, college students, high school students, hipsters, and seniors were all dancing together, uncontrollably, in a state of joy. Franti seems to have completed his mission – that of making the world a better place.